Motorcycle, Scooter, or Moped Accident In Key West? The accident law firm of Florida Keys Injury aggressively represents motorcycle accident victims in Key West and the surrounding areas. We specialize in helping those injured in motorcycle crashes especially those hit by cars, trucks, commercial vehicles, and Ubers & Lyfts. This includes accidents where you were hit while riding a moped, scooter, motorbike, minibike, and/or dirt bike. Marc P. Lyons and Philip M. Snyder are the best moped accident lawyers to get you the maximum settlement for your past and future medical bills, lost wages, and pain and suffering. What is my personal injury claim value? How much does it cost to talk to a lawyer? Is there an accident lawyer near me? The Florida Keys are unique. Many of its residents own mopeds as opposed to cars and tourists routinely rent mopeds to tour The Keys. 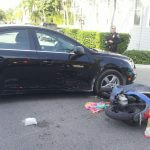 Many tourists are unfamiliar with sharing the road with mopeds and this leads to a higher number of moped accidents in Key West. How Will Your Attorneys Help? Our priority is to ensure that you obtain the best recovery for your injuries. Getting great results for our clients does not happen by accident, it takes hard work, skill, and experience handling Key West injury claims. Call us today, so that we can discuss the entire process and design a custom strategy for your case. By explaining how we build your case from day one, you will have a better understanding of how we add value. How Are Your Attorneys Different? Unlike a majority of personal injury attorneys in the Florida Keys, our attorneys constantly monitor your medical treatment. We keep track of all your bills so you don’t have to do much more than focus on getting better. It is not uncommon for one of our attorneys to text a client five minutes before a medical procedure to wish them good luck. You can count on our moped attorneys to be with you every step of the way and fight to get the insurance company to feel your pain. How Much Does Hiring An Attorney Cost? Accident Attorneys Marc P. Lyons and Philip M. Snyder handle all moped cases on a contingency basis. This means that if we do not collect, you owe us nothing. That is our no-fee guarantee. Contact us today to schedule your 100% Free Consultation.